Kajari Teej - Importance - Mantra - Benefits - How to Observe Kajari Teej? Kajari Teej is observed by women on the third day after Shravan Poornima and it is second among the three Teej festivals – the other two being Hariyali and Hartalika Teej. Kajari Teej 2019 date is August 29. It is mainly observed by married women and young girls and is dedicated to Lord Krishna. Kajri Teez is mainly celebrated in Bundi in Rajasthan and in some parts of Uttar Pradesh, Madhya Pradesh, Chhattisgarh, Jharkhand and Bihar. Kajari Teej is dedicated to Lord Krishna and special pujas and prayers are also offered to the neem tree. Radha Rani is worshipped on the day. She is believed to be an incarnation of Goddess Shodashi. On the day, women and girls wear colorful new clothes and dance and make merry. A community puja is performed around a neem tree. Specific rituals are performed by elderly women and young women learn the tradition and perform it. Special swings are prepared for the day and women take turns in swinging while other women sing and dance. Songs sung on the day welcomes the monsoon rains and praise the love of Krishna and Radha. Kajri Teej in Bundi in Rajasthan is noted for colorful processions. This Teej is also known as Badi Teej in Rajashtan. Married life will be successful. There will be peace and prosperity. It is performed for a better romantic and sexual life. Those facing difficulties in getting married will find relief after observing Kajari Teej. How to Observe Kajari Teej? Women get mud from riverbanks and sow wheat grains in them. The wheat grains will grow and on Kajari Teej day it is cut and placed on the ears of father or brother in the family. Women take blessings of fathers on the day. Married women chant Shodashi mantra and offer prayers to Radha. On Kajari teej, women should not get angry, cheat others and tell lies. Performing donation of clothes, food materials and money will help in achieving peace and prosperity. How to Perform Kajari Teej Puja? Worship is to be performed to Radha Krishna. Puja should be performed on the north side of the house. 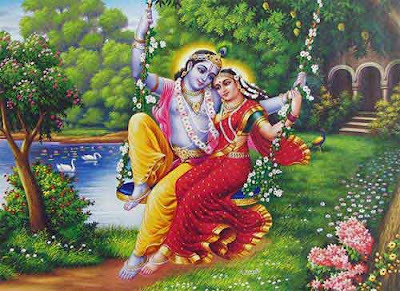 Picture of Radha and Krishna sitting on a swing should be kept on a green color cloth. Lamp should be lit using cow ghee. One wick is preferred. Radha should be offered mehandi. Krishna should be showered with yellow color flowers. Radha Rani should be offered red flowers. The prasad offered should be Sattu (सत्तू). It should be made using jau (जौं), sugar, ghee and mewa. Other offerings include mishri, tulsi and sweet pan. Chant the above given mantra 108 times - keep count on a tulsi mala.